Being a movie fanatic, I am always visiting the local theaters in my town. There's just something about the atmosphere that makes the experience more inviting for me than watching at home. Since movie tickets and over-priced popcorn lose their novelty after a while, I wondered why I enjoyed theaters so much more. It occurred to me that a big reason was because of the quality of sound they set theaters up to immerse us in. Wouldn't it be amazing if we could bring that speaker quality to the comfort of our homes? In our increasingly technological world, many companies are putting forth their best experts to bring us higher quality at-home experiences. With time and perfection, Vizio has become the #1 sound bar brand from 2014 to 2017. The Vizio SB2920 itself is in the top five list of the Best Soundbar Speakers Review of 2017. It is perhaps the most simplistic in design and nature, making it a top choice for people new to using sound bars. Although it does not offer as many extra features as some of its more expensive rivals, they put the design effort into the quality of the sound. Not only is it a choice that is lower on the price scale, but it is also a renowned brand and if you choose the Vizio SB2920; you are getting one of the highest sound quality devices out there! Now we can finally enjoy theater quality movies right in our living rooms! So what is a sound bar and how does it work? A sound bar is a long, horizontal device that contains multiple speakers. Some sound bars offer single cable set-up so that all you have to do is plug the bar into your device or television and you're all set to use it! Other advanced sound bars offer built-in subwoofers which are speaker components designed to emit low bass frequencies giving your music/television the full range of high-quality sound. Additional specifications can include Bluetooth capability to allow you to hook up your mobile devices or computers, built-in streaming capabilities so you can play music directly from the Internet or your computer, advanced remote control options such as connecting your television remote to the soundbar for ease in controlling the volume, and even wall mounting capabilities. There are many brands of soundbars out there, and the Vizio SB2920 is our favorite regarding usability, overall quality, and looks. Product Features 91 dB sound output With <1% total harmonic distortion for crystal-clear, room-filling audio. The Vizio SB2920 has many unique and top quality features. Some of the features include 95 dB of clear sound with less than 1% distortion, built-in easy-to-use Bluetooth capabilities, and Easy upgrade to boost the sound further! The Vizio SB2920 also comes loaded with DTS Studio Sound TM, DTS TruSound TM, and DTS TruSurround TM — all premium audio! The SB2920 comes ready to use right out of the box, including all cables needed to set it up immediately and a remote control. The frequency range is 70 Hz - 19 KHz, the drivers are 2" X 2.25''. Small frame that packs a huge punch. You can purchase this amazing product for around $80; this is one of the least expensive options for soundbars out there. Even if you are not entirely sure what you would want in a soundbar, this is one of the best options for getting your feet wet. It is minimalistic, so it is not overwhelming and is still formidable in terms of sound quality. Two of the more popular sites to buy this item from are CNET and Amazon. We looked at a few of the other notable sound bars in close competition: the SONOS PLAYBAR, the LG Electronics NB3530A, and the Yamaha ATS-1030-R, and compared them based on ease of use, assembly time, design quality, and the warranty of each given sound bar. Although they consider the sound bars listed here top quality based on popularity and sales, we believe the Vizio SB2920 to be the best choice because of its incredible quality and non-demanding price range. We compared the Vizio SB2920 to the competition on the following parameters; Price, Ease of Use, Assembly Time, Design Quality, and Warranty. To maximize the potential of this soundbar, one would need to purchase additional speakers. The price is by far the most expensive on this list. The SONOS PLAYBAR is the first runner-up for the top five Best Soundbar Speakers Review of 2017. Perhaps the most simple set-up of any sound bar out there, the PLAYBAR keeps things straight-forward with a single cable set-up. Although it only has one cable, it contains a multitude of position options and is compatible with any television and any room. Equipped with a whopping nine speakers, the PLAYBAR delivers realistic sound at top quality. For continued ease of operation, the PLAYBAR doubles as a wireless speaker and can easily hook up to any audio device and will stream music directly from the Internet or your computer. Many additional enhancers are available for this product, including SONOS SUB and rear speakers to offer an expansion to 3.1 or 5.1 surround sound! Wireless subwoofer maximizes bass capabilities and overall sound quality. This sound bar offers by far the most versatility in terms of different ways one can use it. Two separate inputs allow for the connection of multiple devices simultaneously. it comes with a bulky speaker that can be difficult to find a place for. Limited to only two inputs for additional devices. Rated #1 on the top five Best Soundbar Speakers Review of 2017, the LG NB3530A offers simple installation and a wireless subwoofer that makes wired speaker management a thing of the past. This sound bar allows you to hook up your smartphone for a versatile listening experience. Whichever method of listening you are in the mood for, the NB3530A has got you covered! 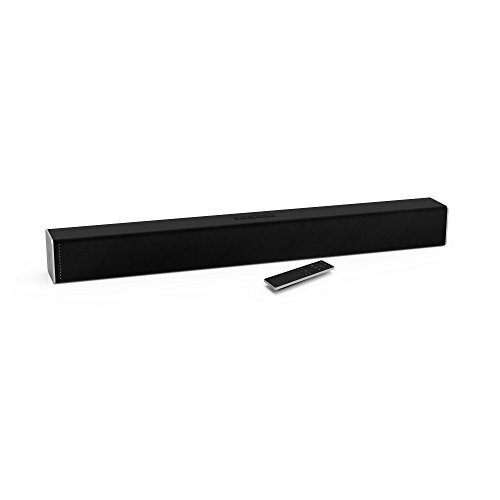 This sound bar also offers two optical inputs to allow you to connect multiple devices at once for optimal convenience. Dual subwoofers enhance sound and bass quality. Taking fourth place in the top five Best Soundbar Speakers Review of 2017, the Yamaha ATS-1030-R comes out of the box with dual subwoofers to enhance the bass while still offering the simplicity of one unit. One can also find wireless Bluetooth capabilities on the ATS-1030-R, ready and able to connect easily to your smartphone, tablet, or any other audio device. Offering perhaps the simplest of set-ups, this single-cabled sound bar even lets you use your television remote to change the volume! With a sleek, low-profile design, this sound bar can mount on the wall and be easily placed in any room or with any television. With an attractive, simple, minimalistic design that is not overwhelming for new users, the Vizio SB2920 packs a huge punch that will impress even the most experienced consumers. Its small, sleek design makes it possible to put just about anywhere, and the built-in Bluetooth capabilities make it easy to use with any device. 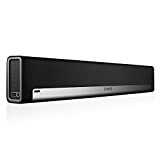 Although this sound bar goes for simple design over advanced features, it is packed full of premium audio that never fails even at the highest volume this bar can produce and with multiple devices connected simultaneously. For it being the lowest-priced item on our list by far, it holds up compared to soundbars more than twice its cost, and they proclaim the Vizio brand as the #1 brand in sound bars for three years in a row. I rate this sound bar 4/5 stars and highly recommend it to anyone looking for that incredible home theater experience! It have a High-quality sound even at higher volumes with minimal distortion; most sound bars are guilty of becoming muffled and fuzzy at higher volumes, losing some sound quality they boast at lower volumes. They have described the quality of sound with this sound bar as "crisp" with a clear definition in the bass at any volume. With an impressive less than 1% distortion, you will not have to worry about using the full capabilities of this sound bar while having to suffer a decline in sound clarity. Although, Fewer extra features; since the Vizio SB2920 is lower in the price range, all the quality lies in the sound. 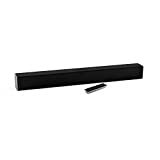 One will not find many advanced features in a minimalistic soundbar such as this one.